With hundreds of proposed changes, the 2017 NESC includes new clearance and loading requirements, new grounding rules, and new requirements for underground facilities. The 2017 NESC will also have updates to the work rules to harmonize with the OSHA Rules issued in 2014. This course will focus only on the changes to the NESC and will assume that participants have a working knowledge of the NESC. The changes will be addressed in terms of possible required changes to design standards and work rules for electric utilities. The class focuses on the major changes to the NESC for distribution applications. Engineers, staking technicians, foremen, and construction contractors will benefit from this one-day course. 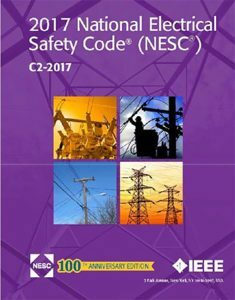 The 2017 National Electrical Safety Code will be released August 1, 2016. With hundreds of proposed changes or additions to the NESC, most directly affecting distribution systems, learning these changes is imperative for personnel responsible for the safe design, construction and operations of an electric utility system. This seminar focuses on the application of the 2017 National Electrical Safety Code, with particular emphasis on the changes to the existing rules and new rules. Attendees will learn the meaning of the safety code rules as well as how to apply the rules in everyday design. Engineers, staking technicians, foremen, and construction contractors will benefit from this 2.5 day course.